The “Vienna Boys’ Choir” is probably the most famous boy’s choir in the world and one of Austria’s most important institutions. Often called “Austria’s young ambassadors” their concerts are especially popular abroad. The Vienna Boys’ Choir emerged from the Boys’ Choir attached to the royal court in the Middle Ages, which was founded in 1498 by the King of the Germans and later Emperor Maximilian I, when he moved his court and court music from Innsbruck to Vienna. Maximilian I ordered that the musicians should include six boys to provide musical accompaniment to the mass, an idea he had taken from the Netherlands, which had come into the possession of the Habsburgs as a result of his marriage to Mary of Burgundy. The musicians and the first members of the choir also came from the Netherlands and adopted the bright, high registers of the vocal polyphony of the Netherlands school preferred by the Emperor. The first director of the choir was Georg Slatkonia, the court chaplain. Since then, the history of the Habsburg Monarchy has been reflected in history of the Vienna Boys’ Choir. Particular mention should be made here of the reigns of Maria Theresia, Josef II, Leopold II and Franz Joseph II. Musicians such as Christoph Willibald Gluck, Wolfgang Amadeus Mozart, Antonio Salieri, Franz Schubert, who was a member of the Choir for six years, and Anton Bruckner, who from 1888 onward was the organist at the Court Chapel, played with the Vienna Boys’ Choir. Until 1918 the choir only sang at court or at its instruction, in particular at church services, private concerts and on state occasions. Unlike the Court Opera, the choir was not taken over by the Austrian state after the collapse of the Habsburg Monarchy and it was only thanks to an initiative of Joseph Schnitt, the rector of the Hofburg Chapel and his friends that it was possible to continue the tradition. In 1924 the “Wiener Sängerknaben” was officially founded and since then has evolved into a professional music group. 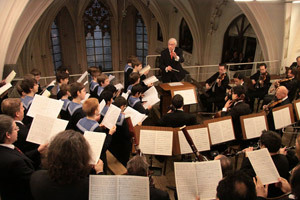 To make up for a chronic shortage of funds during the period of great economic hardship after World War I, the “Boys’ Choir of the Former Hofburg Chapel” started to give concerts outside the Court Chapel. In 1926 they started performing abroad and in 1932 gave their first performance in the USA. The young choristers start their training at the age of six. To ensure they receive the best-possible musical training, the children attend a boarding school in the Augarten Palace in Vienna where the choir has been based since 1948. Today there are approximately 100 choir boys who are divided into four choirs named after the Austrian composers Bruckner, Haydn, Mozart and Schubert. Besides the traditional services at the Hofburg Chapel in Vienna, where the Vienna Boys' Choir sings at the Sunday mass accompanied by members of the opera orchestra, the Vienna Boys' Choir gives concerts all over the world wearing the sailor suits that have been their official uniform since 1924. On Sunday’s the Vienna Boys’ Choir only sings at the Hofburg Chapel where they accompany the mass. We would therefore like to explicitly point out that the Vienna Boys' Choir can only be heard (and not seen) during mass and only after the church service do they appear in front the alter to perform a small number of works for the public.